Yep, that's right -- for the first time in almost two years, we took a vacation together without the kids. On the last such trip, the two of us spent days poking around trails and backroads in the Colorado Rockies, hunting wildflowers. 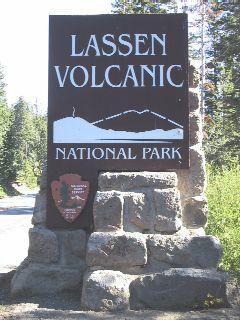 This time (mid-July 2001), we spent a long weekend in and around Lassen Volcanic National Park. How did this happen? Well, with one set of grandparents (Grummy and Farfar) offering to watch the kids, and the other set (Gramma and Grandad) raving about their trip to Lassen before Kathy was born ... hey, who wants to argue with fate? Finally, before we left on Tuesday morning, we drove north of the park to explore Subway Cave, a lava tube in the neighboring Lassen National Forest, just north of Old Station. We have to admit that this was the only walk we did without finding wildflowers. But in the pitch black, what can you expect?